Roger Ebert was a beloved film critic. The phrase itself smacks of the oxymoronic. What film critic, those smugly superior cineastes peering out from next to newspaper bylines or internet film sites and presuming to tell readers why they should or should not find a moviegoing experience worthwhile, can be described as “beloved”? Critics in general are reviled as “those who can’t do” sorts, judging the efforts and struggles of artists from an elevated pedestal of assumed authority that is built on wisps of institutional cloud, if even that. They do not create art but only excrete parasitic effluvia, like so many lampreys clinging to the skin of an elegant but deadly shark. But Roger Ebert was beloved, his death after a protracted and publically open fight with cancer mourned with popular sadness like the exit of one of the movie stars or film directors who he watched, analyzed, interviewed, and sometimes befriended. One such director, the documentary filmmaker Steve James, owed Ebert a solid; Ebert’s praise and support of James’ film Hoop Dreams helped to establish him as one of America’s foremost documentary feature filmmakers. And so James documents both the highlights of Ebert’s rich and vivid life as well as the critic’s vulnerable slide towards death. 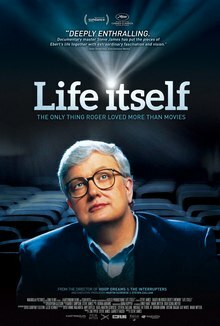 Life Itself is based on Ebert’s memoir of the same name, and includes voiceovers by Ebert reading excerpts of that book over archival photos and video and in concert with other interviews with people who knew him. The narrative of Ebert’s life is intercut with scenes of his convalescence filmed in hospital rooms, rehab clinics, and his home, with his wife Chaz ever at his side. Unable to speak with much of his throat and neck removed and only gradually regaining any capacity to walk, the avuncular, portly, passionate Midwestern film savant famous for his televised battles with critic rival (and eventual friend) Gene Siskel is transfigured but occasionally emerges. His facility with words remains constant through writing pads and computer speech technology, and his positivity through a harrowing experience is demonstrated through the famed thumbs up gesture that he and Siskel made into a cultural meme and imprimatur of cinematic quality. Ebert’s last act, admirably playing out his health problems and physical degradation in the public eye while reviewing, blogging, and tweeting with twice the prolific energy many younger creatives can muster, contributed greatly to his legacy of popularity. But that legacy was well-established long before, as Ebert followed the populist instincts of his training in newspapers and applied it to film criticism. He lead above all with his love of the movies, and always assumed that his audience shared that love. He might try to direct the terms of that love (there was ego and control in the man, of that James leaves little doubt), and he might quibble or disagree with it. But it was an important foundation for Ebert and he never lost sight of it, which is perhaps why there is more public fondness for him than for many of his colleagues (including, it must be said, the late Gene Siskel, who died in 1999). As New York Times film critic A.O. Scott points out, we lives in Roger Ebert’s world in terms of film fandom. The internet has democratized (or at least widely diffused) opinions on film in a way that Ebert was delighted by and very much embraced, and the ascendence of film geekdom in contemporary Hollywood follows from that process. Life Itself does not miss that influence, nor does it shy away from Ebert’s weaknesses: it details his youthful alcoholism, his occasional arrogance, and his testy professional relationship with Siskel (outtakes of their television program involve sniping must more tense and less staged than their broadcasted arguments about movies). Some notable details from Ebert’s life and career are missing, in particular his infamous war of words with Vincent Gallo over The Brown Bunny following a controversial screening at the Cannes Film Festival or his blithe (but partially re-thought) dismissal of video games as art late in life. But James provides a generally complete (albeit just a bit cloyingly admiring) portrait of a film critic who became, in his own way, as much of a star as the people in the movies he reviewed.